The Turkish population is 98% Moslem (Muslim). 85% of the Muslims are 'Sunni' creed, while 'Alevi' creed represent the remaining. (Alevi Muslims are closely linked to Shia Islam). There is no Shia citizen in Turkey. ISLAM is the religion of Moslems. Islam is a religion of peace, mercy and forgiveness. ISLAM (founded in A.D. 622) means 'submission' and derives from a word meaning peace in Arabic. 'Muslumanlar' (plural form) in Turkish. There are 1.5 billion Moslems (Muslims) in the world. The country with the largest Moslem (Muslim) population in the world is Indonesia. An estimated 7 million (Moslems) Muslims live in the USA. Turkey is 98% Muslim country therefore Turks do not celebrate Christmas. Turkey is a secular state and guarantees complete freedom of worship to non-Moslems. Everyone in Turkey has freedom of religion and beliefs. Muslims pray in a mosque in the same way that Christians pray in a church. In a religious context Islam means complete submission to the will of 'God'. ALLAH is the Arabic name for 'God', which is used by Moslems(Muslims) and Christians alike. Moslems (Muslims) believe in only one God, named ALLAH. Of second most importance is Mohammed, the final prophet from a long line. They believe he brought the last revelation of Godâs truth to man, with the help of the archangel GABRIEL. Moslems (Muslims) do not worship the Prophet MOHAMMED, only ALLAH (God). Moslems (Muslims) believe in One Unique Being , incomparable ALLAH; in the angels created by Him; in the prophets through whom His revelations were brought to mankind; in the Day of Judgement and individual accountability for actions; in ALLAH's complete authority over human destiny and in life after death. The Koran, or Quran (KURAN in Turkish), is the Muslim holy book, like the Bible is to Christianity. The KURAN is the record of the exact words revealed by God to the Prophet Muhammad. It was memorized by Muhammad and then dictated to his companions. The basic beliefs of Islam is that ALLAH created this beautiful world and Islamic faith is expressed by observance of the five so-called pillars of Islam. Make at least one pilgrimage to Mecca. Moslems (Muslims) also believe in a chain of prophets starting with Adam(ADEM) and including Noah (NUH), Abraham (IBRAHIM), Ishmael (ISMAIL), Isaac (ISHAK), Jacob (YAKUP), Joseph (YUSUF), Job (EYUP), Moses (MUSA), Aaron and Jesus(ISA), peace be upon them. But ALLAH's final message to man, a reconfirmation of the eternal message and a summing-up of all that has gone before was revealed to the Prophet MOHAMMED (Muhammet) through CEBRAIL (Gabriel). Moslem (Muslim) prayers are set rituals. Before praying, a Moslem (Muslim) must wash hands and arms, feet and ankles plus head and neck in running water. Each Mosque provides washing facilities to Moslems, before they go in for prayers. During 3 or 4 days celebrations, Turks do short visits to their relatives and to near friends in their homes and traditionally candies as Turkish delights which call lokum or chocolates offered and simple, inexpensive presents mostly given to the children. Showing respect by kissing the hands of elders and parents and other family members is an obligatory ceremony of BAYRAM. Some families get together at the house of the oldest family member and have a 'Bayram meal' all family together. Meanwhile the olders give candy or money to those youngsters kissing their hands. In the past, gold coins and money were given however unfortunately this habit has been essentially lost, due to financial reasons. Custom of BAYRAM visits in today's modern life of Turkey, showing as it is going away slowly, especially by the people who lives in the big cities and mostly take a get-away type of short trips in holidays. Dates for these religious days are calculated by the Islamic Lunar Calendar [*] and will change from year to year. or call RAMAZAN BAYRAMI. Celebrations last three days. The word of 'Seker' means candy or sugar in Turkish. SEKER BAYRAMI immediately follows the month of Ramadan (Turk call RAMAZAN) and it is a very important family holiday. It is a time for giving love of ALLAH and respect. This holiday marks the end of the holy month of Ramadan (RAMAZAN). 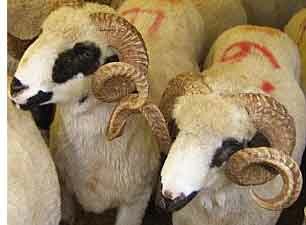 'The Sacrificial Holiday' Kurban Bayrami is the most important Islamic holiday. KURBAN means 'sacrifice' in Turkish. This holiday observed after the pilgrimage to the Islamic Holy Land period (call 'HAC' in Turkish), to thank ALLAH (God) for sending a ram for Prophet Hz.Ibrahim (Abraham) to slaughter instead of his son Ismail (Ishmael). Also; KURBAN BAYRAMI is an important affirmation of one of the key tenets of ISLAM, shared social responsibility. Families who can afford to sacrifice an animal... this can be mostly a ram or goat, will do so and there is a complex code stipulating how the carcass should be distributed amongst friends, family and charitable concerns. If you are planning to visit Turkey during Ramadan (RAMAZAN, in Turkish), contrary to major Moslems (Muslims) citizens, yes,you can eat, drink during the day and this mean it's legally ok and no one will bother to you! Although it's not very polite to eat in front of people during a Ramadan day. Btw; yes, in some of small towns and conservative areas, some of the restaurants might kept closed during day time hours but in the most other ones, food service will be as normal in all hotels. On the others side; traffic can be problem 1 hour before the IFTAR... which is the time when sun goes down and Moslims allow to eat. It is better if you do not take sight-seeing during this time. What is R A M A Z A N ? The Holly month of 'Ramazan' is the month that the QURAN, which is the sacred text of Islam, is believed to contain the revelations made by ALLAH to the Prophet MOHAMMAD (Muhammet). The first day of RAMAZAN may vary based on global location. Ramazan (Ramadan) is the 9th month in the Lunar Year [*]. RAMAZAN is the month of blessing, repentance, forgiveness. And Ramadan(Ramazan) give Moslems(Muslims) a persfective that by cutting oneself off from worldly comforts, even for a short time, a fasting person (ORUCLU in Turkish) gains true sympathy with those who go hungry as well as growth in one's spiritual life. Moslems (Muslims) recite Quran (Koran) intensively during this holy month. The fast (ORUC in Turkish) is mandatory for all adult Moslem (Muslim) men and women, except the insane, infirm, sick or traveling and pregnant or feeding mothers. In the month of RAMAZAN a healtyh Moslem (Muslim) should stay away from all forbidden things and ask his/her needs and wishes from ALLAH (God). It is a time for prayer and fasting. For 30 days a good Moslem will not eat -even licking a postage stamp is not allowed- , drink, smoke and and sexual relations from first day light until dusk. If a Moslem (Muslim) physically unable to do this, he/she must feed a needy person for every day missed or/and fasting after Ramadan(RAMAZAN) to pay back those missed days. Children begin to fast (ORUC) and to observe the prayer from puberty, although many start earlier. A Moslem (Muslim) is told to give SADAKA (charity) and FITRE (alms given) to the poor before Ramazan ends. 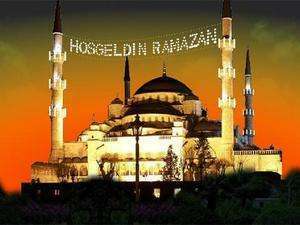 The last 10 days of Ramadan (RAMAZAN) are more important as the faithful watch for 'KADIR GECESI' (the Night of Power) during which the revelation of the book to the Prophet was completed. In a way it is considered the climax of Ramadan (RAMAZAN) and Moslems (Muslims) stay awake all night praying or listening to sermons from the Imam (religious leader in the Mosque). Ramadan (RAMAZAN) is a month of brotherhood, renewal of relationships and festivity and the rigor of fasting ends with the celebration of 'SEKER BAYRAMI' (Candy holiday). During Ramazan (Ramadan) many of local municipal administrations provides free IFTAR dinners to the public, while various aid organizations and businesses distributed packages of food stuffs. District municipalities sets up many-many tents throughout the city where citizens were served free IFTAR. The meal which breaks the fast (ORUC) at sunset during Ramadan (RAMAZAN) is called in Turkish 'IFTAR'. Most of the Turks prefer to break their fast (ORUC) with an olive or a date then specially prepared dishes, treats and drinks served. During Ramazan in Turkey most of the restaurants may be closed from dawn to nightfall, especially in small cities and towns. Also other businesses operation hours may change schedules. Unlike common calendar (Gregorian calendar), which is Solar based. Islamic calendar is Lunar based but does not mean that Moslems (Muslims) worship moon. It is simply another way to count days of the month and the year. Like all Islamic months, RAMAZAN (Ramadan), the 9th lunar month, begins after sighting Crescent, and not the birth of the new moon. Lunar calendar, is shorter than the Gregorian calendar by 11 days. The result is that Muslim religious holidays fall on different dates each year. - Do Turkish people celebrate Christmas? Because, Turkey is 98% Muslim country therefore Turks do not celebrate Christmas. But 31st of December evening Turks celebrate the New Year itself in a big way. People wishes to each other the best of the best for the incoming year and start with a fresh outlook . Meanwhile, usually children get some presents. To contrast the US, in general Turks do not gather on New Year Eve in open areas. But in last years, people also began to go outside to public gatherings to celebrate the new year with fireworks. In big cities some of the companies build giant TV screens at the city's circles so people can watch what is happening at the other gatherings in the world. Other than that the most of the people get together in their homes and have whole family a wonderful dinner, the dinner that specially prepared with many kind of delicious dishes and deserts on the table. They enjoy listen music, dance, play fun games and watch special New Year shows on TV. All TV channels air programs with special artists' performances. Meanwhile, nowadays, young people mostly goes out to night clubs and musical shows. While the world is moving toward globalization, as you can imagine the things are becoming shared almost everywhere now... That is also valid for Christmas & Noel trees. Lately some people in the big cities began to use symbolic pine trees as a decoration for the new year. Meanwhile this gets important criticism from most of the religious citizens.